British Tamils (Tamil: பிரித்தானியத் தமிழர், [pirittāṉiyat tamiḻar]) are British people of Tamil origin. The term is used to denote people who have their homeland in Indian state of Tamil Nadu, or in northern areas of Sri Lanka. However, "Tamil" is not one of the predefined tick-box answers for the ethnicity question on the UK Census. The tick-box options under the "Asian" category include "Indian", "Pakistani" and "Bangladeshi", but respondents can also tick an "Any other Asian" box and write in their own answer. In the 2011 Census, the number of respondents writing in "Tamil" was 24,930 in England, 128 in Wales, 99 in Scotland and 11 in Northern Ireland. 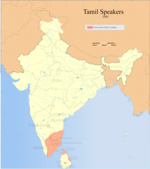 The number of people in England and Wales that speak Tamil as their main language was recorded as 100,689. In 2008, community estimates suggested that 150,000 Tamils lived in the UK, with a 2006 Human Rights Watch report putting the number of Sri Lankan Tamils in the UK at 110,000. A 2009 article in the FT Magazine put the figure at up to 200,000. Immigration of significant numbers of Tamils to the United Kingdom (UK) started with labour migrants in the 1940s. These were joined by students moving to the UK for education in the 1970s, and by refugees fleeing the Sri Lankan Civil War in the 1980s and 1990s. The UK has always had a strong, albeit small, population of Sri Lankan Tamils deriving from colonial era immigration between Sri Lanka and the UK, but a surge in emigration from Sri Lanka took place after 1983, as the civil war caused living conditions deteriorate and placed many inhabitants in danger. It is now estimated that the current population of British Sri Lankan Tamils numbers around 100,000 to 200,000. They are spread out throughout the country. The largest population of British Sri Lankan Tamils can be found in London, chiefly in Harrow (West London) and Tooting (South London). The community generally has far lower birth rates in comparison to other South Asian ethnic groups, with one child for two parents being the norm. Unlike immigrants to countries in Continental Europe, the majority of Sri Lankan Tamils that went to live in Anglosaxon countries achieved entry through non-refugee methods such as educational visas and family reunion visas, owing to the highly educated in Sri Lanka being literate in English as well as Tamil. This resulted in the first generation diaspora falling into highly professional jobs such as medicine and law after studying at British educational facilities. The result was that the community was perceived as being similar to the rest of the Indian community (see:Ugandan Indian Refugees) and therefore also gave them a more middle class image. The community, for the most part, did not suffer from the problems with criminality, anti-social behaviour, or poor socioeconomic demographics that have plagued other immigrant communities, although there are small Tamil criminal gangs present in London. The Tamil Chamber of Commerce (TCC), for example, estimated in March 2011 that there are five thousand Tamil-owned businesses in UK with a turnover of 1 billion GBP. The Sri Lankan Civil War has played a crucial role in the political actions of the Sri Lankan Tamil community. A number of activist organisations have been established by first generation immigrants in order to represent the voice of the Sri Lankan Tamil community on the island, and several major protests have been held in order to forward various viewpoints surrounding the civil war, most notable of which was a mass demonstration in April 2009 which drew nearly 100,000 protestors. The second generation have, however, generally been more emotionally detached from the politics of the civil war, giving more priority to the issues in the United Kingdom and European Union, and preferring to refrain from involving themselves into the more extreme activism surrounding the civil war. The second generation generally do not speak Tamil fluently enough to relate to South Asian culture and media, beyond news and politics, and therefore have traditionally avoided popular Indian culture like Kollywood (music and films) and literature. A number of scholars have suggest that this points to a relative success of integration by the community. Sri Lankan Tamils are mostly Hindu, albeit a large Christian population also exists; much of Sri Lankan Tamil traditional culture is rooted in Hinduism and Christian Tamils find it increasingly difficult to maintain a cultural identity that is separate and distinct from Hinduism. As a result, many Christian Tamils and Hindu Tamils are culturally similar and often identify most strongly as Tamils rather than with their respective religious communities. 'Raj' argued that there has been a 'Hindu resurgence' in the UK, whereby the young second generation living in the Hindu diaspora are reconstructing and realigning themselves with the faith of their parents, although religious adherence has largely declined over time in the United Kingdom as a whole. Chakravoty discusses how British Sri Lankan Tamil youth often carried forward elements of Tamil culture from their parents into their own daily lives, such as the widespread practice of religious rituals such as the Bharatnatyam. ^ "Ethnic Group". Office for National Statistics. 2011-11-02. Retrieved 30 April 2015. ^ "Table CT0010EW 2011 Census: Ethnic group (write-in responses), local authorities in England and Wales". Office for National Statistics. 30 January 2013. Retrieved 30 April 2015. ^ "Ethnic group (detailed): All people" (PDF). National Records of Scotland. 2013. Retrieved 30 April 2015. ^ "Ethnic group - Full detail: QS201NI". Northern Ireland Statistics and Research Agency. Retrieved 30 April 2015. ^ Gopal, Deepthi; Matras, Yaron (October 2013). "What languages are spoken in England and Wales?" (PDF). ESRC Centre on Dynamics of Ethnicity (CoDE). Archived from the original (PDF) on 1 May 2015. Retrieved 30 April 2015. ^ a b Dissanayake, Samanthi (8 December 2008). "UK Tamils polarised but powerful". BBC News. Retrieved 27 December 2009. ^ Beeston, Richard (13 June 2008). "Stop Tamil Tigers raising money in UK, says President Rajapaksa". The Times. Retrieved 28 December 2009. ^ "Funding the 'Final War': LTTE Intimidation and Extortion in the Tamil Diaspora" (PDF). Human Rights Watch. 14 March 2006. Retrieved 27 December 2009. ^ Asokan, Shyamantha (16 October 2009). "Young Tamils swap bombs for BlackBerrys". FT Magazine. Retrieved 30 April 2015. ^ "Sri Lanka: Mapping Exercise: London, February 2007" (PDF). International Organization for Migration. Archived from the original (PDF) on 26 July 2011. ^ "The Economist". The Economist. 2010-01-21. ^ "The Sri Lankan Population of Great Britain" (PDF). Archived from the original (PDF) on 2017-08-19. ^ "Children of Refugees" (PDF). Archived from the original (PDF) on 2016-05-14. ^ "FT on Sri Lankan Tamils". ^ "Unique Socioeconmic Positioning of Sri Lankan Tamils" (PDF). ^ "Tamil Chamber of Commerce". ^ Rutter, Jill (2003). Percentage of Children Gaining 5 A* - C at GCSE. ISBN 9781447314615. ^ "Political Identity of the British Tamil Diaspora" (PDF). ^ "The Sri Lankan Tamils" (PDF). ^ Bloch, Alice; Hirsch, Shirin (2017). "Refugees and the Second Generation". Ethnic and Racial Studies. 40 (14): 2444–2462. doi:10.1080/01419870.2016.1252461. ^ a b Cowley-Sathiakumar, Shanthini Rebecca (August 2008). The Sri Lankan Tamils - A comparative analysis of the experiences of the second generation in the UK and Sri Lanka (PhD). University of Leeds. ^ Chakravorty, Pallabi; Gupta, Nilanjana (2012-08-21). Dance Matters: Performing India on Local and Global Stages. Routledge. ISBN 9781136516139. This page was last edited on 23 April 2019, at 17:08 (UTC).